Beauty, history, character, charm, quirk – Waterville has it all. Both the town and the world-class golf course, that is. I am more familiar with the course than I am with town, but on one visit during the month of July, it was my good fortune to stay, with my partner, Kevin McGrath, at the famous Butler Arms Hotel. 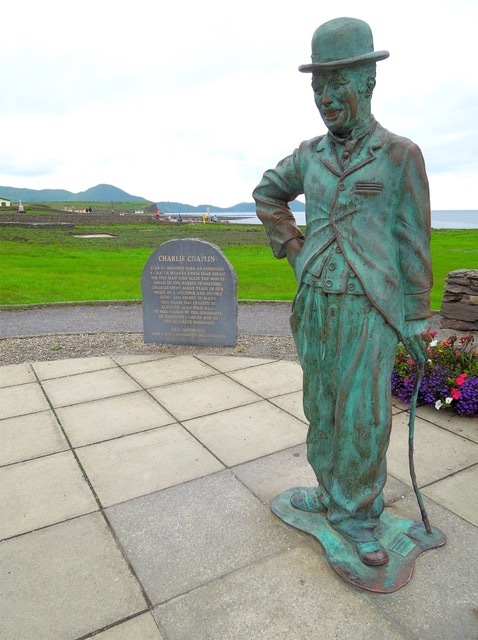 Perhaps made famous because it is here in this quaint seaside town that Charlie Chaplin (1889 – 1977) and his family vacationed for many summers. During our stay, we had it all—sumptuous suite with a modern marble bathroom, view of the sea, and all just a short stroll to the park where the life-size bronze sculpture stands as a shrine to the genius that was Chaplin. The artist, Alan Ryan Hall, certainly captures the essence of the comic Chaplin character, but it was Eugene O’Neil’s daughter, Oona, that captured Chaplin’s heart, and thus provided the link to her ancestor’s homeland. She was just an 18-year old fledgling actor when she married the 54-year old Charles Spenser Chaplin in 1943 and became his fourth wife. For the first decade of their married life, the Chaplins lived in Beverly Hills. Although Oona initially wanted to pursue an acting career, after they eloped she abandoned this desire, focusing on her husband, with whom she had eight children. The 1940s and 1950s were a difficult time for the couple and in 1952 the Chaplins moved permanently to Corsier-sur-Vevey, Switzerland. They did return to the U.S. in 1972 when Chaplin received a special achievement Oscar at the Academy Awards. The award was presented by Jack Lemmon and Chaplin was given a twelve-minute standing ovation, the longest in the Academy’s history. Chaplin was further honored by being made a Commander of the Most Excellent Order of the British Empire (KBE) in 1971, and the following year he received a special award by the Venice Film Festival. Chaplin’s childhood in London was one of poverty and hardship but by the time he was nine he had grown interested in performing. He started out clog-dancing with a troupe that toured English music halls in 1899 and 1900, but after two years he knew he wanted to form a comedy act. By the time he was fourteen, Chaplin registered with a theatrical agency and at sixteen he starred in a West End production of Sherlock Holmes. From there he performed in various comedy sketches and developed a popular burlesque piece, which enabled him to become an accomplished comedic performer. In 1919, Chaplin co-founded the distribution company, United Artists, with Douglas Fairbanks, Mary Pickford and D.W. Griffith, which gave him complete control over his films. He wrote, directed, produced, edited, starred in and composed the music for most of these movies, in a career spanning more than 75 years. 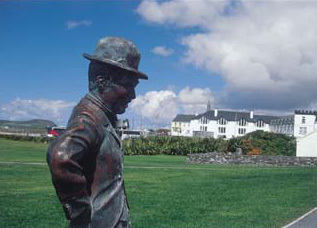 The iconic “Tramp” character, with baggy pants, jacket too tight, hat too small and shoes too big that became what is now the centerpiece for the Charlie Chaplin Film Festival in Waterville. Inaugurated in 2011, the festival honors the pioneering spirit of the great film maker. The event spans several days and features a range of performances, includes a film competition with four different categories – comedy one them of course – and wrapping up with a gathering of Charlie Chaplin Lookalikes. Other famous people who would follow in Chaplin’s outsized footsteps at The Butler Arms Hotel include Hollywood royalty like Walt Disney. More recently, in 2014 and 2015, the hotel welcomed the cast and crew of Star Wars “The Force Awakens” when they came to shoot scenes at the steep rugged mass of rock known as Skellig Michael. The guests included Mark Hamill, Daisy Ridley, JJ Abrams and Kathleen Lucas. 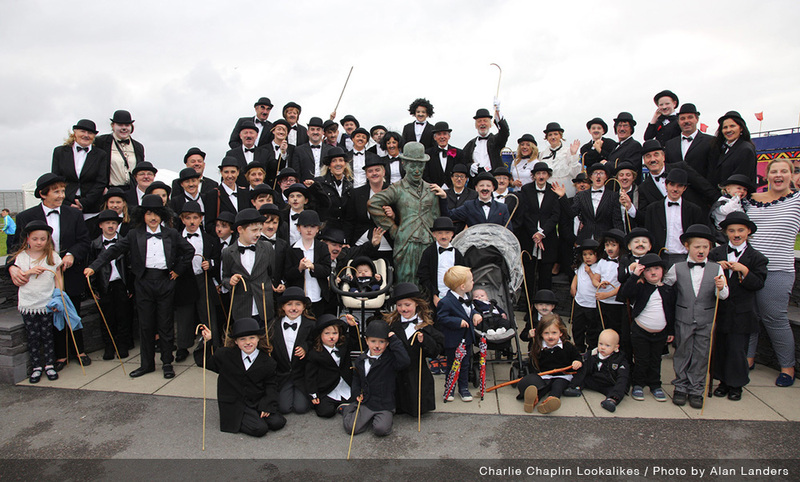 In April of 2016, the Chaplin’s home overlooking Lake Geneva was turned into the Charlie Chaplin Museum.